its not drilling the hole that is the problem it is drilling the hole straight. 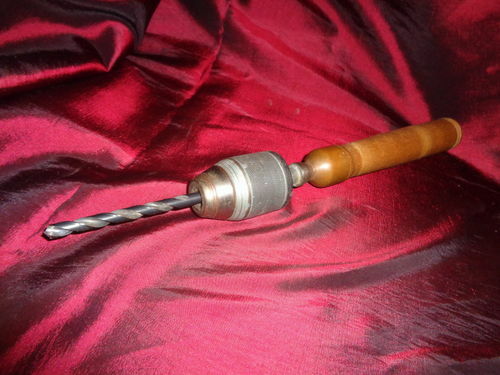 Drill it on your lathe using something like this. All it is is a chuck from a drill I wore out years ago, but the chuck was still good. Make a small handle, drill out a hole to fit the bolt that has the proper threads to match the chuck, and use JB Weld to anchor it in. Works great when I use it. 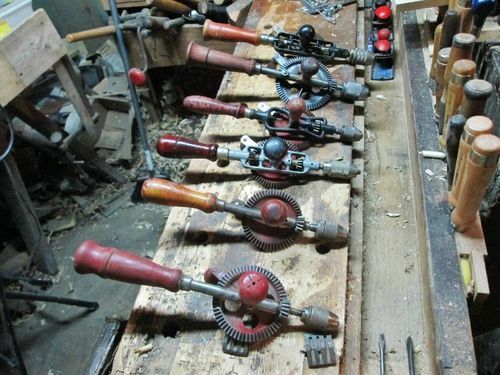 Or you could even mount the drill bit into Vise grips to hold it, turn on the lathe and drill out the hole. If you started center, it will stay verrry close to center with no noticeable wobble. .
And, why do you have a need for a gouge with a 19” handle? You add another 9-10” of gouge to that, and you won’t be able to clear the tailstock if you have a small lathe.The long handle also hits the ways when doing an undercut or the sides of a bowl when hogging it out. If you still can’t do it with the jig on your drill press. Try it the Roy Underhill way. Clamp the blank to a framing square then eye-ball it with your hand drill using the excess blade of the square as a guide. Comes out pretty darn close.